Amalio-Joaquín de Marichalar studied Law, Political Sciences and Sociology at Madrid’s Complutense University, then undertook a Master’s Degree in Agricultural Business. He has promoted a number of highly symbolic and pioneering projects in the Spanish insurance sector. 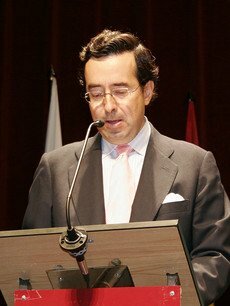 He is a member of various private institutions and associations and is chairman of the association Foro Soria 21 para el Desarrollo Sostenible. He was a member of the Ministerial Preparatory Meeting for the UN World Summit on Sustainable Development, held in Bali in 2002 and participated in the UN World Summit on Sustainable Development, held in Johannesburg in 2002, as the official representative of the Provincial Council and City Hall of Soria. He attends, moderates and speaks at a wide range of international conferences, summits and seminars.